Algolux was the first to successfully automate the lengthy manual process of tuning ISP-based cameras. NaturalIQ augments the objective CRISP-ML approach by learning from the customer’s set of ideal images to more predictably achieve a subjectively optimal camera tuning in a matter of hours or days. Algolux, the leading provider of machine learning optimization platforms for autonomous vision, today announced NaturalIQ©, an artificial intelligence (AI) approach that allows customers to automate the difficult task of subjective camera tuning by learning image quality (IQ) preferences from their own natural image datasets. Algolux pioneered the industry’s first automated approach to optimal IQ tuning by applying novel machine learning solvers and objective metrics, or KPIs, through its award-winning CRISP-ML software platform and methodology. This approach has been proven to significantly reduce tuning time and cost, while massively improving scalability. See “Algolux Introduces Latest Release of CRISP-ML Image Quality Tuning Automation Software” announcement released today. But embedded camera providers still struggle to achieve a differentiated “look and feel” or emulate best in class consumer cameras. This results in many tuning iterations in the attempt to converge on the conflicting stakeholder objectives and requires hard-to-find expertise. NaturalIQ allows camera teams to tune against a dataset of their preferred natural images that represents the image quality outcome they desire. This image dataset can be easily created with photo editing tools or captured with a best in class camera of choice, dramatically simplifying the subjective tuning process. Once a meaningful image dataset is collected, the images are rapidly displayed and captured by the camera configuration being tuned. 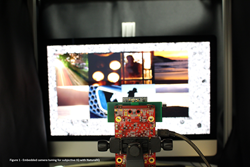 NaturalIQ iteratively analyzes the camera output to determine how close the camera’s tuning parameter settings are to the goal defined by the image dataset and searches the parameter space to find the best settings (See Figure 1). For camera teams that have deep image quality tuning expertise, this significantly reduces the effort and uncertainty involved with subjective image quality requirements. But for teams with limited or even zero IQ tuning resources and expertise, NaturalIQ provides a more intuitive method to differentiate their cameras and quickly respond to changing subjective requirements. NaturalIQ is currently in initial trials with availability targeted for end 2018. Please contact Algolux at https://algolux.com/contact-us/ if you are interested in participating.